Species belonging to the genus Amaranthus have been cultivated for their grains for 8,000 years. Amaranth plants are classified as pseudocereals that are grown for their edible starchy seeds, but they are not in the same botanical family as true cereals such as wheat and rice. Amaranth species that are still used as a grain are Amaranthus caudatus L., Amaranthus cruentus L., and Amaranthus hypochondriacus L. The yield of grain amaranth is comparable to rice or maize. The grain was a staple food of the Aztecs and an integral part of Aztec religious ceremonies. The cultivation of amaranth was banned by the conquistadores upon their conquest of the Aztec nation. However, the plant has grown as a weed since then, so its genetic base has been largely maintained. Research on grain amaranth began in the United States in the 1970s. By the end of the 1970s, a few thousand acres were being cultivated there, and continue to be cultivated. 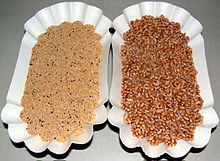 Much of the amaranth grain currently grown is sold in health food shops. Grain amaranth is also grown as a food crop in limited amounts in Mexico, where it is used to make a candy called alegría (Spanish for joy) at festival times. In other preparations, the grain can be popped like popcorn and then either mixed with honey, or served with milk, dried fruit and nuts like a cold breakfast cereal. Amaranth grain can also be used to extract amaranth oil, a pressed seed oil with commercial uses. Raw amaranth grain is inedible to humans and cannot be digested because it blocks the absorption of nutrients. Thus it has to be prepared and cooked like other grains. In a 100 gram amount, cooked amaranth provides 103 Calories and is a moderate–rich source of dietary minerals, including phosphorus, manganese, and iron. Cooked amaranth is 75% water, 19% carbohydrates, 4% protein, and 2% fat (table). The table below presents nutritional values of cooked, edible form of amaranth grain to cooked, edible form of wheat grain. Amaranthus retroflexus, known commonly as "pigweed"
There are about 75 species in the genus Amaranthus. Many species of amaranth grain are hardy plants, showing resistance to changes in pH, salt content, environment, temperature, and drought. Amaranth grains have genetic diversity and adaptive ability. Some examples of Amaranth species are Amaranthus albus, Amaranthus blitoides, Amaranthus hybridus, Amaranthus palmeri, Amaranthus powellii, Amaranthus retroflexus, Amaranthus spinosus, Amaranthus tuberculatus, and Amaranthus viridis. Amaranthus retroflexus, "pigweed," is a wild amaranth species native to the United States and is considered a weed in the Northeast, Nebraska and Great Plains, South, and West. The name derives from the plant's tendency to sprout where hogs are pasture-fed. Although both its leaves and its seeds are edible, pigweed amaranth has not been cultivated as a food crop. The Aztecs cultivated amaranth as a staple grain crop in what is now Mexico during the pre-Columbian period. Amaranth was used by the Aztecs for tamales, tortillas, and atole (hot cereal). In addition they formed shaped images of their gods with amaranth, agave, and maize during the sacred month of Huitzilopochtli. At the end of the month, the statues were eaten by the families to "take the god into them". When the Spanish prohibited religious acts like this, and imposed the religion of their god who was worshiped with wheat, amaranth cultivation decreased. In current Mexican culture on the Day of the Dead, amaranth seeds are offered as snack foods for the spirits. 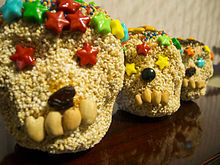 Edible skulls were historically made with amaranth seeds, although today they are made out of sugar. ^ a b O'Brien, G. Kelly; Price, Martin L. (1983). "Amaranth: Grain & Vegetable Types" (PDF). ECHO Technical Note. ^ "Cereal Grains and Pseudo-Cereals - Dictionary definition of Cereal Grains and Pseudo-Cereals | Encyclopedia.com: FREE online dictionary". www.encyclopedia.com. Retrieved 2017-04-13. ^ "All About Amaranth". USA Emergency Supply. ^ J.N. Cole (1979). Amaranth: from the Past, for the Future. Rodale Press, Emmaus, PA.
^ a b c "Amaranth grain, uncooked per 100 g". USDA National Nutrient Database, SR-28. 2016. ^ Robert L. Myers and Daniel H. Putnam (1988). "Growing Grain Amaranth as a Specialty Crop". Crop Systems. University of Minnesota. FS-03458-GO. Archived from the original on 2007-10-03. Retrieved 2007-10-03. ^ "Amaranth - Alternative Field Crops Manual". University of Wisconsin & University of Minneasota. Retrieved 1 September 2011. ^ Ricardo Bressani, Luiz G. Elias and Arnoldo Garcia-Soto (1989). "Limiting amino acids in raw and processed amaranth grain protein from biological tests". Plant Foods for Human Nutrition. 39 (3): 223–234. doi:10.1007/BF01091933. ^ Písaříková, B.; Peterka, J.; Trčková, M.; Moudrý, J.; Zralý, Z.; Herzig, I. (2006). "Chemical Composition of the Above-ground Biomass of Amaranthus cruentus and A. hypochondriacus" (PDF). Acta Vet. Brno. 75: 133–138. doi:10.2754/avb200675010133. Archived from the original (PDF) on 2012-04-02. Retrieved 2011-09-19. ^ Garcia; et al. (1972). "Composition of Air-classified Defatted Com and Wheat-Germ Flours" (PDF). Cereal Chemistry. 49 (5): 499–507. Archived from the original (PDF) on 2012-03-28. Retrieved 2011-09-19. ^ "Nutrition Content - Wheat Germ Crude per 100 g". Conde Nast for the USDA National Nutrient Database, Release SR-21. 2014. Retrieved 1 September 2011. ^ "Wheat, hard red winter. USDA Nutrient Database". ^ "Cereals, whole wheat hot natural cereal, cooked with water, without salt. USDA Nutrient Database". Archived from the original on 2016-03-12. Retrieved 2015-09-04. ^ a b c Zhu, Fan (2017-01-22). "Structures, physicochemical properties, and applications of amaranth starch". Critical Reviews in Food Science and Nutrition. 57 (2): 313–325. doi:10.1080/10408398.2013.862784. ISSN 1040-8398. PMID 25831476. ^ Rastogi, A; Shukla, S (2013). "Amaranth: A new millennium crop of nutraceutical values". Critical Reviews in Food Science and Nutrition. 53 (2): 109–25. doi:10.1080/10408398.2010.517876. PMID 23072528. ^ "U.S. Invasive Weeds". plants.usda.gov. Natural Resources Conservation Service, US Department of Agriculture. Retrieved 2017-03-29. ^ a b c d Saul Elbein (2013-04-17). "Amaranth: The Seeds That Time Forgot". The Texas Observer. Retrieved 2017-03-29. ^ a b Sebastia, Brigitte (2016-11-18). Eating Traditional Food: Politics, identity and practices. Routledge. ISBN 9781317285939. ^ a b Karen Castillo Farfan (29 October 2014). "Decoding The Food And Drink On A Day Of The Dead Altar". National Public Radio (USA). Retrieved 2017-03-29.